Maduluwawe Sobitha Hamuduruwo and Medagoda Abayatissa Hamuduruwo differ in their world views. The differences are so deep that an attempted comparison would be absolute blasphemy. It would be as heretical as a comparison of Gandhi – the Mahathma with Bin Laden- the fundamentalist. 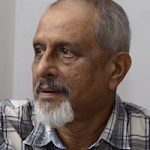 The reported tête-à-tête between President Sirisena and Medagoda Abayatissa Hamuduruwo in cloistered confidentiality is an alarming eye opener. It alerts us to politics of caprice. It prompts this retracing of the life, times and pronouncements of Sobitha Hamuduruwo. Events overtaking us makes it necessary for the nation to be reminded how Sobitha Hamuduruwo single handedly made the idea of a common candidate a credible proposition, making the Sirisena Presidency to happen. A parallax view offers an angle specific vision. The appearance of an object and its position changes with the change of the angle of viewing. Maithripala Sirisena the common candidate had an angle. Maithripala Sirisena the President at his swearing in at Independence Hall had a different angle. Maithripala Sirisena President of the Republic and President of the SLFP now has a totally different angle. Flummoxed and fuddled by this crisis conundrum, this essay is an attempt to come to peace with myself for voting for the common candidate on 8th January 2015. This is also an exercise of catharsis for this writer’s sanguinity in composing prose in praise of this President. This is a desperate bid for atonement for the folly of believing that Maithrpala Sirisena will be different. On 21st November 2014, Maithripala Sirisena, the General Secretary of the SLFP and Minister in the Mahinda Rajapaksa Cabinet announced that he would contest the presidential elections as the common opposition candidate. The idea was to deprive Mahinda Rajapaksa Executive President and President of the SLFP a third term as the supreme law giver of the land. In under 47 days Maithripala Sirisena was elected President of the Republic. This writer is the father of two daughters, and knows how daughters adore their fathers. Chathurika Sirisena has written about her Janadhipathi Thaththa. Since this writer has not read the book, ethical propriety precludes the writer from asserting that she has not made any reference to the role of Sobitha Hamuduruwo in making her ‘Thaththa’ the Janadhipathi of this land. That said, the subject is too serious a matter to indulge Chathurika by agreeing that her Janadhipathi Thaththa is one of history’s inevitable products. He is not. He is an accident of history. Her Telecom Bappa has already attempted to reverse history by banning a website. The scurrilous contents that sometimes appear in the website earn contempt and condemnation of all decent minded citizens. The banning of the website is an equally outstanding obscenity in this age of digital enlightenment. According to reports, Janadhipathi Thaththa is currently engaged in transacting a compact with dethroned tyrants to make the SLFP strong. The euphoria of January 8th, 2015 has given way to a directionless bewilderment. There is indeed great disorder under our heavens. The rainbow in the cloud has evaporated. The drought of deceit has shriveled the soil. The good governance sapling has withered. Oligarchic bonds asphyxiate the people, depriving them of oxygen of accountability. The President’s call to Basil Rajapaksa, his inclination to accept counselling of Medagoda Abayatissa Hamuduruwo convener of the Gotabaya Rajapaksa front ‘Eliya’ are definite signs of a grand reversal. The situation demands that we go back to the drawing board and review the blueprints of Sobitha Hamuduruwo the architect and author of the 8th January 2015 covenant. Medagoda Abayatissa Hamuduruwo with whom the President is now in a compact of unity was then a declared adversary of our Sobitha Hamuduruwo. There is no single word in English to describe schadenfreude. It is an essentially German philosophical premise – secretly celebrating failure of others. 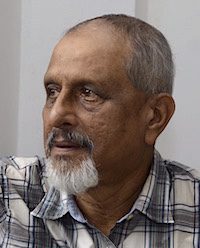 Militant Mahinda promoter Medagoda Abayatisssa Hamuduruwo was biding time to celebrate failure of Sobitha Hamuduruwo and his movement for a just society. He stood for continuity of patronage. The other stood for social justice. Sobitha Hamuduruwo built his movement as a catalyst for change. He avoided encounters of meaningless conflict. He encouraged Mahinda Rajapaksa to underestimate his impact. It is our good fortune that he succeeded. In retrospect it is Sobitha Hamuduruwo’s good fortune that he did not live to see the day when the common candidate made his Faustian compact with the parvenu priest of Pepiliyana. It is time, for President Sirisena to be told the home truths about revolutions and reform processes. They don’t fall out of the sky in 47 days of politicking. Collective consciousness of a people is not a spontaneous occurrence. As suggested in the title, this is a parallax assessment. The good, the bad and the difference are viewed from different angles. Cover one eye and focus on an object. Then cover the other eye and focus on the same object. Because each eye provides a different viewing angle, the object will appear to move. Presidential Candidate Sirisena genuinely believed that failure would send him six feet under. We saluted him for his courage. On the day he was sworn in, President Sirisena was deeply aware of the seductive allure of power. He had just defeated a good man turned wicked by power. He knew only too well the world of a narcissistic clan that wished to hold on to power at all costs. He knew that there will come a time when he too would be tempted to compromise integrity and oppress others in the process. In the address to the nation after the inauguration of his Presidency, Maithripala Sirisena displayed that rare grace of recognizing the corrupting influence of power. He knew, that too often, we start doing good and then suddenly and surely, we get twisted. We abandon promises made and begin to serve our own ambitions and personal comforts. Worse, we succumb to the avarice of kinfolk. Knowing the perils of power, he announced that he was a one term President. Sobitha Hamuduruwo in his Kotte Pansala approved but with a caveat. ‘We shall see’ was his pregnant yet muted sigh. That in a nutshell explains the predicament of our do-gooding President. It also defines the entire territory of our predicament. That is those of us who voted for the common candidate. He has changed tracks. Good governance is side tracked. He now wants to be the exclusive candidate of the party he decamped from on 21st November 2014. Since assuming office, he seems to balance do-gooding with bad doings, sloppy doings and downright stupid doings. The President elected to deliver good governance and cast out corruption, has not covered much territory beyond the 19th amendment. Indeed, there are some legislative cosmetics – right to information act, less than ideal electoral reforms for local and provincial elections and an office for missing persons. What is missing is commitment. His Prime Minister is mired in scandal. Corruption investigations initiated with great brouhaha have lost all signs of bounce and buoyancy. The director general of the Commission to Investigate Allegations of Bribery and Corruption (CIABOC) was compelled to resign because the President was shocked and surprised that a former service chief was made to appear before a magistrate. Ambivalence and equivocation have been the key indicators of Presidential direction. Establishing his political base in the SLFP has been the principal presidential focus. Nobody has bothered to remind President Sirisena that when he vacated his office as SLFP general secretary, he also ceased to be a member of the SLFP. Polemics have a purpose on stage but before common sense and the Courts of Law it is a different ball game. He should have left the business of reclaiming the soul of the SLFP to Chandrika. The President must not take us to be knaves. As he has reminded us on many occasions where would he be if his bid failed? The assumption was that with victory, the SLFP would fall in to his lap. Well, it did not. Mahinda recovered faster than anybody including this writer figured. Give the devil his due. Mahinda never stopped campaigning after he recovered from the initial shock. We do not know what passed between Mahinda and Ranil in that dawn meeting at Temple Trees on 9th January 2015. Let us not even bother to ask Ranil. He is not in the business of informing people. Ranil’s business is lecturing people. When defeated candidates were brought in to parliament on the national list, Sobitha Hamuduruwo was quick to read the signs of perfidy that awaited us. Our accidental redeemer, Maithripala Sirisena has not read Antonio Gramsci’s ‘Modern Prince’. President Sirisena is not equipped to break Mahinda’s grip on the party apparatus and apparatchiks. Mahinda has developed his hold in ten years of patronage, sharing of loot, and a shared contempt for values. Now the challenger – Maithripala has begun to share the same contempt for values in the public discourse. Maithri had an option. He could have developed a new set of values. He was well placed to bring together a diverse set of social, political and intellectual forces to build a progressive historical bloc. He could have carved out a space for a new political value chain. Time will tell us sooner than later where the SLFP is headed. Maithripala Sirisena’s presidency is not the result of a miraculous phenomenon. The New Town Hall on 21st November 2014 was not our Tahrir Square. His common candidacy did not in just under 47 days between 21st November 2014 and 8th January 2015, produce a Maithri for President miracle. That is the stuff of blurb writers, including yours truly. The recorded origin for the search for a common candidate can be traced to 29th May 2012. On that day Sobitha Hamuduruwo, launched his offensive to demolish the Mahinda Rajapaksa monolith. A group of disciples, followers and well-wishers organized a symposium at the BMICH on 22nd May 2012 to pay tribute to Sobitha Hamuduruwo on his 70th Birthday. There he made his call to end the Mahinda monolith, rid the country of Gauleiters of Gotabaya and break Basils barriers of rent collection. The call made by Sobaitha Hamuduruwo on that historic gathering of a determined few was excitingly expressive. ‘Maha Henaya Paradawamu’ was his anguished cry. The Sinhala word ‘Henaya’ is expressive of unfathomable calamity, an unimaginable atrocity. He likened the Mahinda Rajapaksa regime to a ‘Maha Henaya’ that was devouring the land and its people. When the new regime that promised reform took over, the mentor Sobitha Hamuduruwo was a weary wanderer and an alert beholder of unfolding events. He was not content with the dismantling of a regime that was a moral monstrosity. He well knew the monster lurking in every one of us. Maithripala Sirisena mistakenly believes that his 47 days messianism made the change. He speaks about the risk he endured. He speaks of the international good will he earned. He has to date, not uttered one syllable on the Sobhitha effect on his presidency. We are all entitled to our opinions in our deformed democracy. On 29th May 2015, five months before boarding the ferry across Samsara, Sobhitha Hamuduruwo presided over a public forum. It was attended by the President, Prime Minister and Former President Chandrika. The President and Prime Minster were reminded of the ten points program that they were committed to implement. “We will not slacken our vigilance’ Sobitha Hamuduruwo pledged. Life of Sobitha Hamuduruwo is epic poetry. History will not forgive either President Sirisena or Prime Minister Ranil Wickremesighe for pilfering such epic poetry. Bertolt Brecht’s short poem on the Berlin uprising in 1953 is a compelling post script. Thanks as always.The dream of Sobitha thero and the peoples dream for a better future was destroyed right on the first day of the regime change.What a bunch of leaders who think they are unique.Just faiiled leaders. I always respect Late Rev. Sobitha Thero. But I am sure, he too was not aware of the gravity of the problem any govt would face after driving away Rajapakshes. What I feel today, is, the current DUO should come forward and expose all the few hundreds of billions that the current govt has to pay gapping up the debts deliberately came accumulated due to grave mismanagement of Rajapakshe stupid men. All the grace periods for any loans came into be effective after the current govt took the office. For some reasons current duo hide the ground realities of the levels of debts left behind by most abusive leader ever the country produced – none other than Rajapakshe. Was it not Prof. David Kumar who launched the “One Issue” candidate for PE in his columns? The 47 day conceiving period was insufficient even with white-hopper aphrodisiacs for our kind of politics; for somewhat better democratic governance is a reality. noble farmers in circumstances so humble. They climbed the political mountain over the years and, mob-like, made vast fortunes for family and siblings – calculatedly and dishonestly. Low grade chemicals, fertilizers, dancing with the tobacco lobby, crooked land deals – all contributed totheir new found wealth. And the rural rattaran duwa even audaciously published a book, with many VIPs in attendance, claiming a special place in the history of the land for Janathipathi thatha. Comedy becoming farce you would say – but they hold sway, at least momentarily. The yakkos, as usual, are taken for an enormous ride. Normally by those coming from the Manor. But for a change nowatimes by the humble themselves – double-tongued surely. Square pegs in round holes at the height of governance!!! What else can you expect to follow but mediocrity, chaos and resultant tension. Corrupt political culture of the present parties are beyond repair. We either get the colonials back like in 1815 or change the culture of the people from the very bottom by educating the people to think the right way and live the right way to the accepted standards of developed countries and then have politicians create a new party so that country could move ahead. We have ruined our selves with utter ignorance and stupidity of our narrow minded leaders that dressed themselves in the national ambude and hid behind the main religion, pretending to be good Budhists,which they are not but humbugs and fraudulent. This sickness is worldwide prevailing in the underdeveloped third world. Shortest solution is to have a honest dictatorship but like Gaddafi that encounted stupidity and backwardness of the people he ruled,people who are carrying the religious baggage which he could not make them give up,inspite of he been ruthless. End would have justified the means but the Western powers intervened unjustly to protect their interests and loot Libyan wealth deposited abroad. It’s a no win situation for the third world unless we follow the western country’s’ culture with every aspect like in Singapore.Therefore we the helpless will be the victims of these scoundrels for generations until the country is bankrupt and the people rise up and request foreign intervention. We are far away from that day, sadly and until then most of us will try to escape the developed countries for a better life that is denied to them by our criminals who run the country regardless .. He will never and ever win again. Shamelessly there talking of merger, Insulting the voters who voted for YAPALANA, We are fools?. Typical Mahavamsa Mentality. cheering a corrupt governing style. How about the maha henaya of Bond scam scandle and many other scam. It looks Maithripala doe snot want to get rid of cheaters and the thieves. Bank managers, governors are still govt employees. Ministers got caught in bond scam are tthe legislation to fit their thefts. So, mahavamsa mind set is forgetting everything. IS this cheearing is for neglecting all the scams and bankrupting the country. PRema Keerthi De alwis had told that Mahinda Rajapakse wanted him to modify a nationalist song in the name of MR. He had to die because he did not change it. Ranil knows it, I heard. Jim Softy buruwas – bond scam case is just an tiny fraud compared to few hundreds of billions that Rajapakshe have grabbed. This report will reveal everything next. I BELIEVE; YOU GUYS and the Rajapakshes are the headache to this country. Jimbumsy, you as a fly found on their heaps of kakka shouldbe well aware, pointing the finger at Bank scam is just for the moment only… Rajapkashes will have to be beheaded by the laws if not now in the future. How much Ranil should bear the responsibility for making good governance a farce, not different to MR brothers regime, by his involvement or/and continuing support for bond scam squandals .isnt it bond scam derailed the journey towards good governance. Isn’t true that MS was unable to act decisively against Ranil and bond scam culprits to keep the credentials of this government. Isn’t it true bond scam neutralised all scams done by MR brothers. Your grievances of Sobithas dream falling apart and not mentioning effect of bond scam leading to current political affairs misleading. MS to stand tall should act quickly as possible with every resources available to complete the bond scam case . Ranil should atleast declare that he will not contest future elections. If you could campaign for these eventualities Sobithas’s dream may find a life line . We knew the coming colour was no when blackguards like S B Dissanayake, Vijithamuni de Soysa, Sumathipala & others were appointed through the National List.. I believe that Sobitha Hamuduruwo & Prof. Wijesuriya etc. should have stood against at the very instance. Even now he is scared of a scoundrel like Gota. He believes that Gota’s supporters supporters will rise. That what the Army is for if they riot. You cannot make a silk purse out of a sow’s ear. That’s what Sirisena is. Do you want to get rid of bribery corruption bond scams tax evasion racist politicians ten percent ministers un Buddhist monks and shoddy judges, then you should do one thing. Forget about Sobitha now. Bring back Prabakaran and give him President’s power for a month. One week is enough for him but extra three weeks is required to bring back the billions hidden in foreign countries by our politicians. Can’t afford to have our children used as President VP’s guards. I must agree with this idea, even reluctantly. The man tells the home truth about our country! That “PICTURE” by the CT to highlight the subject of the article speaks volumes and volumes and is very appropriate. Thank you CT. Rev. Sobitha knew from where that “ODOUR” was coming and he was holding his nose for a while, perhaps until that “ROTTEN CARCASS” was BURIED. Unfortunately he was “compelled” to hold the nose too long. Douglas, you said it before I did. Cannot agree more! 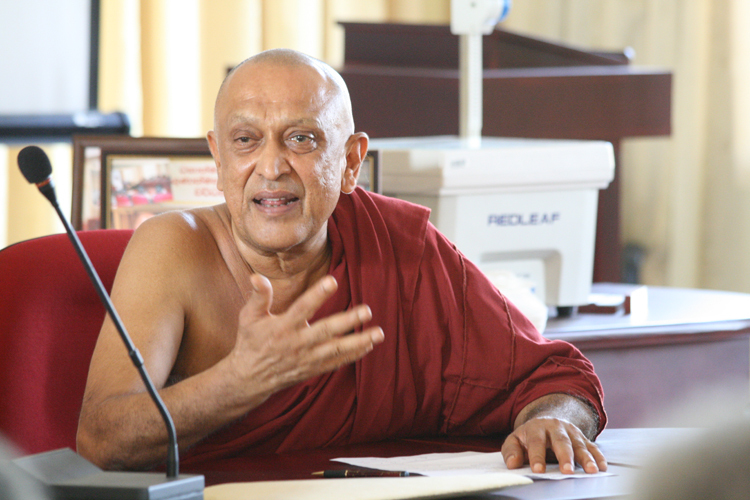 Failure of Shobitha Thero’s dream can only be pinned party to the |President. There are other forces in play. Take Cabinet Members for example, some of them have major allegations against them and they will not allow President to deliver on his promises. These Cabinet Members will block anything that would affect them and their benefits. On the other hand the Speaker did the biggest mistake by recognizing a second opposition in the Parliament ” Joint Opposition”. The percentage of rogues and murderers is much higher in this group than the Cabinet or the Yahapalana Government. There are two fundamental aims of this group 1) Protect Mahinda Rajapakse Family 2) Block every action of the Yahapalana Govt. The Speaker should take full responsibility for recognizing this group in the Parliament when there is an Official Opposition. Take the Unions, they are all short sighted, including highly educated Doctors. They are all playing politics and are short sighted. Short sighted because they are not worried about the future of the children and the future of the country. In Sri Lanka we have so many holidays that has made us one of the lowest productivity generating countries. When trade union actions are taken normal workers and people are affected and the productivity goes further down. Take the Buddhist Priests, they cannot manage their own flock but want to manage the country. Its a sad to say at this rate Shobitha Thero’s dream will never come true. Its the duty of the President and the Prime Minister to turn the page and make difficult decisions and focus on making the Thero’s dream come true as they both promised this to get their votes. The mistake is in our part to believe in miracles! Miracles do happen, but not always! Anyone else would have simply repeated what Mr Sirisena did? Who asked us to believe in a man? Power Corrupts and absolute power corrupts absolutely! What happened in Jan 2015 was not a revolution, but change of a man. Next time if there is a next time, let a revolutionary situation emerges first and then let the people together- not leader or leaders jointly destroy the old and built up a new. It is amazing senior journalists continue to write this crap. Why we have to live in the past when the present is a disaster. IT is this conclusion of a certain committee. Anyway, Maithripala sirisena has been very disappointing. by now, he could have taken many decisions. I can not believe why he appointed thilanga Sumathipala on national list and handed over the cricket too to make it bankrupt. He is a know casino man. We can not decide differently except saying PResident is also for corruption. He may have accumulated some wealth some where. HE has told so many words to support that. My question is how long that should be allowed to continue. Your article should be translated to Sinhala language and publish it in a sinhala daily or weekend paper… the average will understand the bloody hipocrisy …they will decide the fate of the scumbugs..